Her mother remarried in 1866 to Francis Marion Shaw, a veteran of the Civil War who had lost his right arm in a skirmish near Cedar Key, FL in 1864, and who raised Eliza and her brothers as his own children. 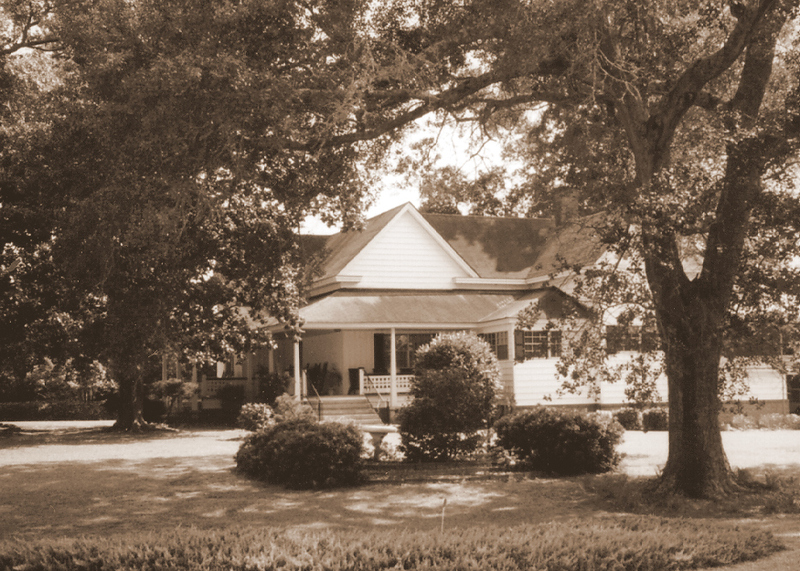 Eliza grew to womanhood on her step-father’s farm at the community of Lois near Ray City, GA. “She was educated in the rural schools of the Lois, Georgia community, and attended the Pleasant Primitive Baptist Church with her mother and siblings…. At the age of 17, on June 6, 1880, she married Sullivan Jordan “Sovin” Knight, son of John W. Knight and Candacy Leaptrot.” Sovin’s brother was Primitive Baptist minister, Aaron Anderson Knight, of Ray City. The marriage was performed in Berrien County by William H. Snead, Justice of the Peace. In 1878, Sovin Knight was a young farmer who owned 50 acres of land in section 375 of the 10th district, on the northeast bank of Cat Creek, about four miles north of Rays Mill (now Ray City), GA. This was probably part of his father’s holdings. The land was valued at $250 and he had livestock valued at $100. Bryan Shaw describes the land dealings of Sovin Knight in detail in his Shaw Family Newsletters. After marriage Eliza and Sovin moved just southeast across Cat Creek to the adjacent land lot 408, to a 113 acre farm situated on Indian Camp Branch. Within a few years Sovin was farming 412 acres slightly farther to the northeast on lots 364 and 365 on the north side of Indian Camp Bay, about six miles northeast of Ray City. Sovin worked this farm on Indian Camp Bay for the next twenty years on his own account or on behalf of his father, John W. Knight. Nearby were the farms of Levi J. Gaskins, John A. Kirkland, and Joe S. Clements. 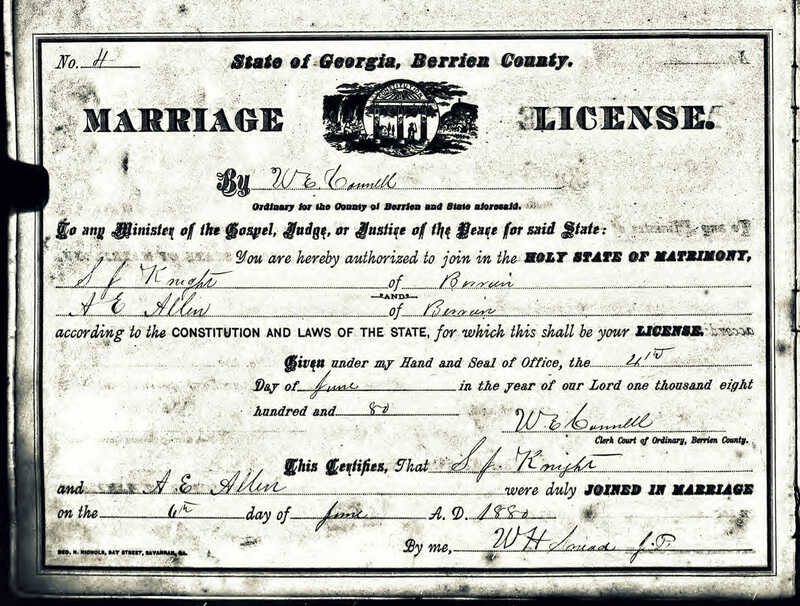 Lillie C. Knight, – born February 2, 1885, Berrien County, GA; died March 12, 1885. Ora Kathleen Knight – born May 16, 1904, Berrien County, GA; married Henry Alexander Swindle November 24, 1920; died June 2, 2003, at Savannah, GA.
Eliza and Sovin suffered a serious setback when the Knight house burned down in January 1909 while they were attending the funeral of Sovin’s aunt Rhoda Futch Knight. In January, 1911 Sovin J. Knight sold the remaining farm property in Berrien county to Dr. Pleasant H. Askew, prominent physician, businessman and landowner of Nashville, GA, and moved Eliza and their four youngest children to Brooks county, near Barney, GA. 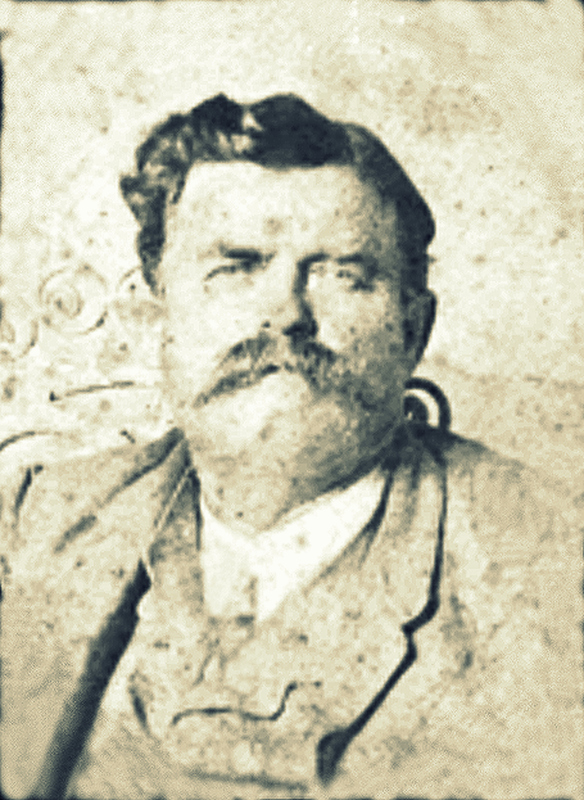 Shortly after their move to Barney, “on April 16, 1911, just 26 days after the purchase of the new farm, Sovin suffered a severe heart attack and died in his new home. He left his wife of 31 years, a widow with three children, a survivor once again.” Sullivan Jordan Knight was buried at Pleasant Cemetery, near Ray City, GA.
After settling the estate of her husband about 1914, “Eliza and her two daughters returned to Berrien county, where she moved into her parents’ farm home just outside of Ray City. She joined the newly constituted New Ramah Primitive Baptist Church at Ray City by letter of transmission. 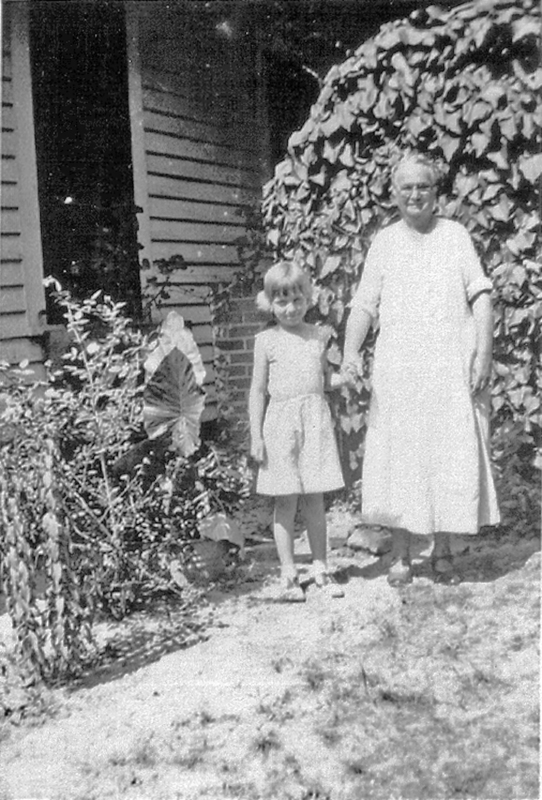 About 1917, she moved with her aging parents into town to a new home located on the north side of Jones Street and just east of Ward Street. 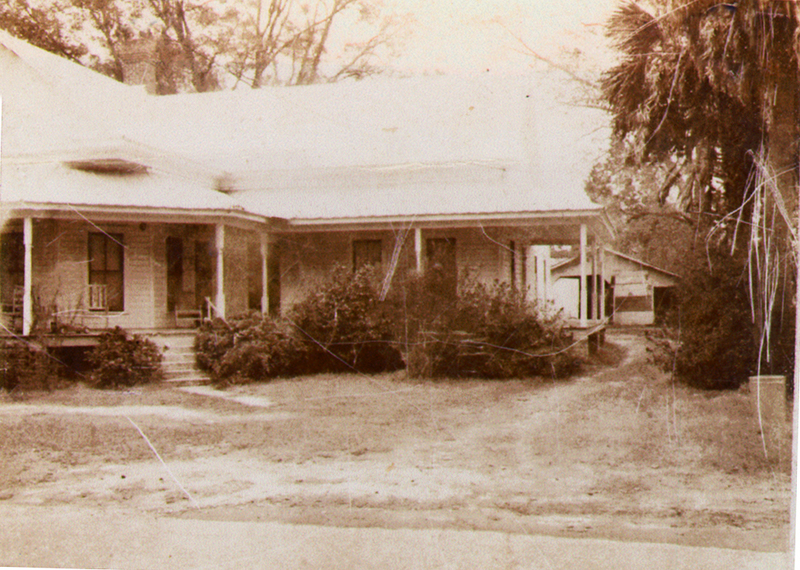 Home built circa 1917 for Francis Marion and Rachel Horne Shaw was later the residence of Gordon V. Hardie and wife, Addie Hodges Hardie. 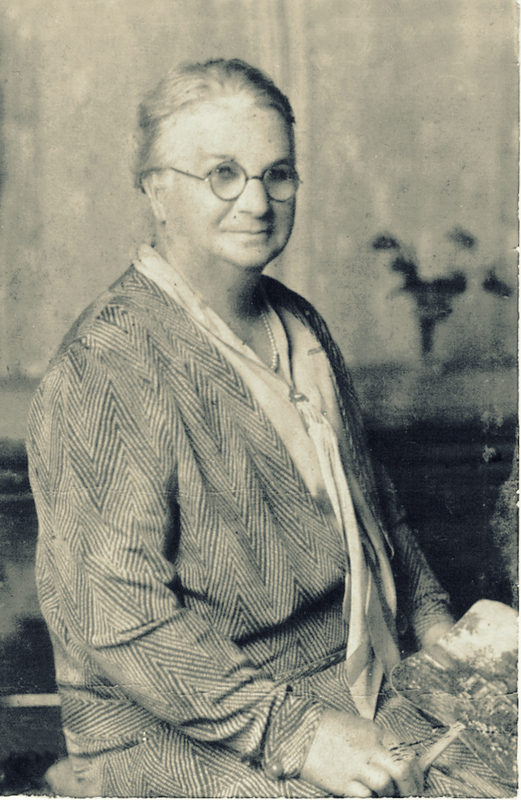 Eliza lived with her parents in their Ray City home, raising her last two children, until November, 1920, when her youngest daughter, Kathleen was married to Ray City merchant Henry A. Swindle. Ann Eliza Allen Knight, passed away on November 4, 1945, at the age of 83. 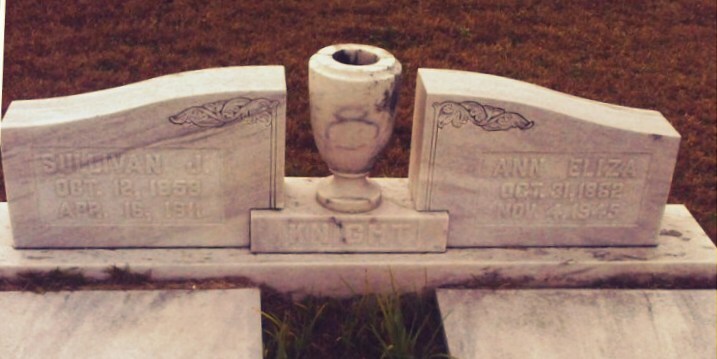 She was buried next to her husband at Pleasant Cemetery, near Ray City, GA.
Special thanks to Bryan Shaw for research, content and images contributed to this article.